The oasis, desert–oasis ecotone (DOE) and desert compose the typical landscape structures in arid regions. The detection of landscape structure changes and quantification of the driving forces are vital to sustainable ecosystem management. Previous studies did not integrate the three landscape types, especially considering the role of the DOE, to detect landscape changes. (1) Detect the spatio-temporal dynamics of the landscape structure in the middle reach of the Heihe River Basin from 1990 to 2015. (2) Identify the key driving factors for landscape structure changes and quantify their contributions. The decision tree classification algorithm was combined with visual interpretation to extract oasis, DOE and desert areas. Status and trend indicators, transition matrix and landscape metrics were used to characterize the landscape changes. Redundancy analysis and variation portioning analysis were integrated for quantification of driving forces. Landscape change was characterized by oasis expansion (+ 37.21%) via a one-way transition with an unbalanced status. The contraction of DOE (− 12.73%) and desert (− 8.50%) areas mainly occurred on the periphery of the oasis. 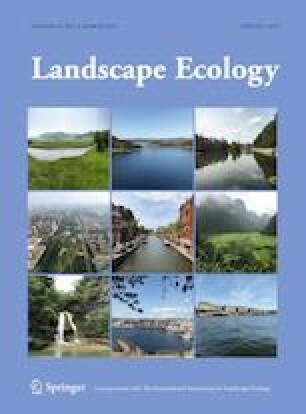 The landscape structure changes were mainly driven by the population, river flow and gross domestic product with unique contributions of 35.99, 9.01 and 7.68%, respectively, and a cumulative contribution of 96.64%. The mutual transformations among landscapes showed distinct spatio-temporal variations. Human activities, especially demographic factors, drove the changes in landscape structure. The development of oasis areas should be controlled within a suitable scale, and the DOE should be protected to maintain the stability of ecosystems in arid regions. This research was financially supported by the National Key Research and Development Program of China (2017YFA0604703), the National Natural Science Foundation of China (41822103 and 91425301), the Chinese Academy of Sciences (QYZDY-SSW-DQC025) and the Youth Innovation Promotion Association CAS (2016040). The data used in this study, if not collected by the authors or acknowledged in the text, were provided by the Heihe Program Data Management Center (http://www.heihedata.org). We would like to thank the Linze Inland River Basin Research Station Experimental for field experiment support. We would to thank the editor and two anonymous reviewers for their constructive comments which improved the quality of this manuscript.